The Battle of Berlin was the third of three major bombing offensives launched by the Royal Air Force's Bomber Command in 1943-44. The first battle, the Battle of the Ruhr, was aimed at the cities and towns of the Ruhr Valley, Germany's industrial heartland. The Battle of Hamburg, codenamed Operation Gomorrah, was a series of air raids conducted by the RAF on the city of Hamburg, which began at the end of July 1943. The Battle of Berlin was fought between November 1943 and March 1944 and was the longest, most sustained offensive by the Royal Air Force's Bomber Command against a single target. Bomber Command undertook 16 massed bombing attacks on Berlin to destroy the German capital city. 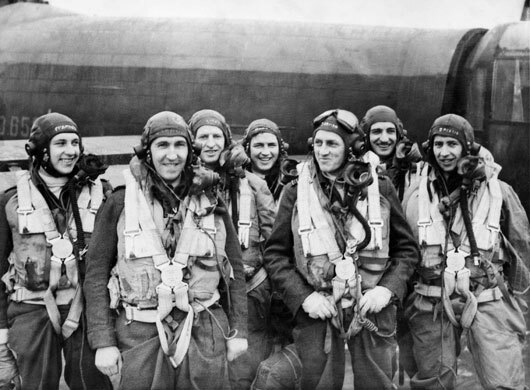 Many Australian pilots flew in the Battle of Berlin and a number were shot down in enemy territory. In total, the RAF lost over 1,000 aircraft and 7,000 aircrew, more than had been predicted. Arthur "Bomber" Harris of RAF Bomber Command had earlier commented that the Battle of Berlin would "cost us between 400 and 500 aircraft," but that "it will cost Germany the war." Throughout the Second World War, bomber aircrews suffered higher casualties and received more decorations per capita than any other element of the Allied military forces. 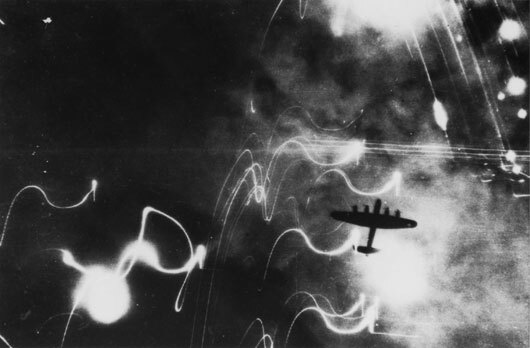 A Lancaster on a night bombing raid on the German city of Hamburg (AWM 044855). 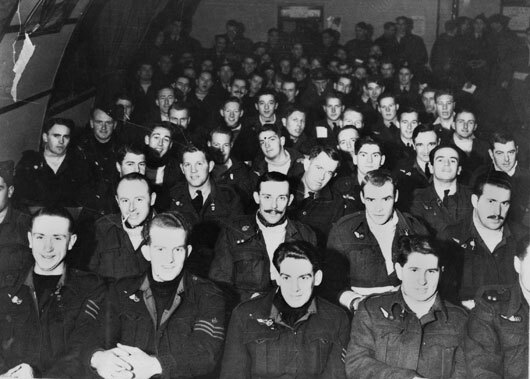 Air crew personnel of 460 Squadron RAAF, being briefed prior to an operational flight over enemy territory (AWM 069822). 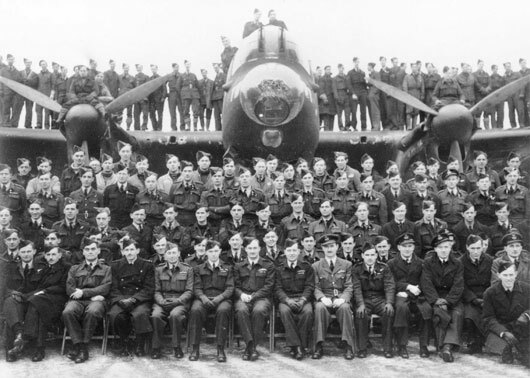 A bomber crew of 460 (Lancaster) Squadron RAAF, pictured at RAF Station Binbrook (AWM 081318). 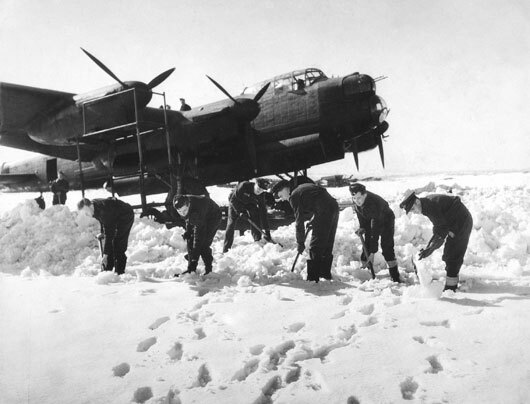 Allied air force members shovelling snow off a runway in front of a Lancaster bomber aircraft at Fiskerton RAF Station, Lincolnshire (AWM P00811.010). 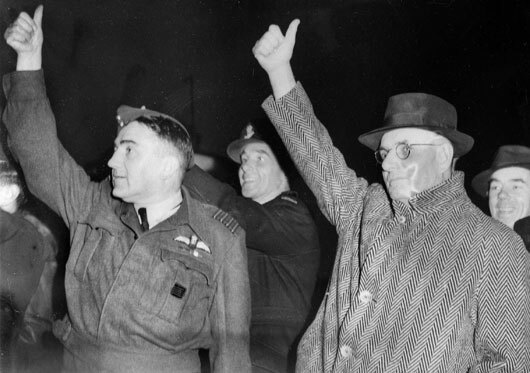 Australian Prime Minister John Curtin farewells an aircraft departing on a mission during his visit to 463 Squadron RAAF in Lincolnshire, England (AWM SUK12195). 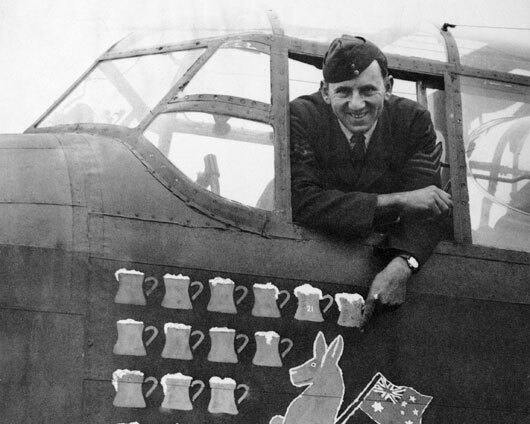 Crew of 467 Squadron RAAF recorded every raid in which they participated by painting a beer mug on their aircraft (AWM UK0189). 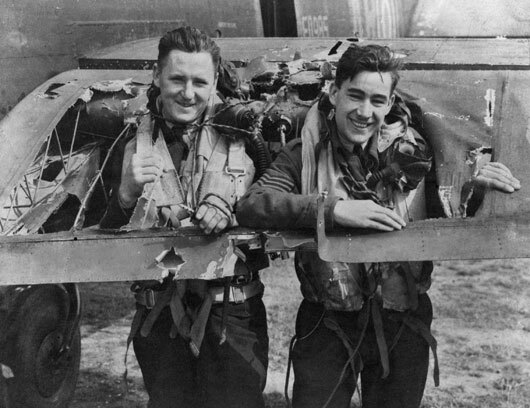 Two crewmembers of 460 Squadron RAAF demonstrate the size of a hole in the tail plane of their aircraft, badly damaged by an enemy night fighter during a highly successful raid (AWM UK0393). A group portrait of air and ground crew members of 460 Squadron RAAF, taken at RAF Station Binbrook in Lincolnshire, England (AWM UK2416).